Notes from the Underground: Why So Serious? Never before has Batman ventured outside the fictitious borders of Gotham city into our reality in order to fight evil. In The Dark Knight he does. He goes to Hong Kong to bring a criminal to justice and in effect he tells us that this Batman is not confined to the remote boundaries of fiction anymore, the dark hero has crossed over to our reality. Batman has left the imaginary realm of Gotham city or more accurately has tried to bring both the city and himself closer to us. This dark knight is far from being an entirely fantastical superhero inside a Hollywood movie. He has broken away from fantasy and visited upon topics that are very close to us; topics that reflect the world we live in. Chris Nolan gives Gotham city what no one before him has dared to give; Normalcy. There's more to the Dark Knight than just a battle of good versus evil, there's a question of what one must do to fight evil. How dark you must go in order to fight evil and not loose your goodness. Batman is faced with the troubles that are not in our law books or clearly defined in our general ethics. Bruce Wayne is ever so present in this movie and he realized that he's not a hero and neither is his alter ego. He is someone who must do what it takes to fight darkness even if it is to lose himself entirely. Perhaps this is why there's an emphasis in the entire movie that he is not just another superhero, he's a vigilante and all the criticism that applies to someone who takes the law into his own hands applies to Batman. He is not all about taking the right way, but he is about taking the necessary way, even if it renders him an immoral criminal. He is the man who must make the difficult decisions that nobody dares to make at the expense of his image. 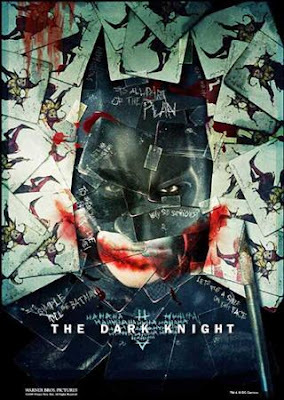 The whole movie has treaded forcefully on many borders of morality, and the image of Batman as a hero is compromised. In case you haven't followed yet, the last two Batman movies are not extensions to the Batman superhero created by Tim Burton in 1989, the first of both gave us a message so clear that we don't want to believe, Batman 'Begins'… Chris Nolan writes off all previous Batman movies and declares that a new Batman begins. "Why do we fall?" asked in Batman Begins. "So we can learn to pick ourselves up," is the answer. The Batman with Clooney was certainly the biggest fall and I think The Dark Knight has picked himself up again with this one. I've always liked the Batman concept but despised the movies, most of them anyway. 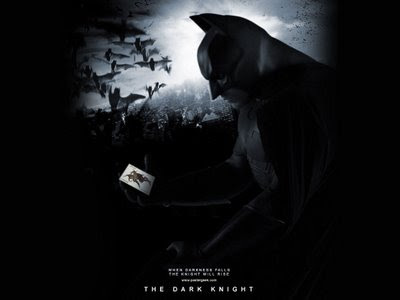 It was as if the movies camouflaged Batman or made up for his normalcy to give him the superhero effect. What I mean is that out of all the superheroes, Batman has no special powers, he only relies on gadgets and the likes. Most other movies have dehumanized Bruce Wayne and turned him into a clear cut action hero who knows how to choose what is right. His alter ego makes very little mistakes with respect to morality and is never presented with a task too great. Directors were trying so hard to create a magical mystical image of Gotham that would transport us to a comic book hero's world and cover up for the fact that Batman has no special abilities. The result was a certain remoteness from all that was happening and disconnection from all who Batman was and he was about. In this movie, Batman and Bruce Wayne melt, they complete one another and they're far from perfect. Their morality and their capabilities are questioned. Batman acknowledges that if things change, Gotham will not need a Batman, and he is contrasted by the White Knight, Harvey Dent, who is in fact a hero and does things the right way. Wayne believed it was Dent's time to rise to the occasion, just as much as Dent believed that Batman was just the right vehicle leading up to the change. The characters in old Gotham city were previously one dimensional and the plot was so thin decorated by theatrics and lunacy. Never has commissioner Gordon been so real as he was brought to life by the outstanding Gary Oldman. Commissioner Gordon rose in ranks due to his integrity and his valor, a kind of valor reserved only for our masked hero in previous films. He managed to take a bullet and even managed to save Batman's life. Gordon has choices as well, to let the truth disappear and to lie in hope of attaining a greater good. The new Gotham is a more terrifying place than the crazy one that we were presented with earlier. It's not that the old Gotham was less dangerous, on the contrary, it was a sad scary place, it's just that there was no one in it worth caring for to start with and nothing in it that Batman alone can't handle. This contrast is evident between the films when in 'Batman Forever' the riddler and two face present Batman with a choice to save the woman he loves or his sidekick. He manages to save them both. The joker presents the new Batman with the same choice, but this time it's done right, Batman can't save them both. They're both the same and he's not an idealist, he chose the woman he loved. Batman isn't enough for the new Gotham City. There's just too much work for one man even if he is a super hero. That's what makes it scary, because villains are smarter and people are multi dimensional and can be cared for. In the old Gotham people didn't have the will to fight back, in the new one, people have the will but lack the power. The terrifying thing is Batman's need for people, he needs them more than his gadgets and his darkness. Batman is more real because he's more human. He needs his life to be saved and his identity protected. Bruce Wayne does not magically disappear into his alter ego, he's the man beneath the mask and the movie makes sure we're painfully aware of this fact. The caped hero is aware of his need for others. Batman, Gordon and Dent are involved together in doing what's right, it needs them all. It's not a one way street for a change, each of them has an opinion which is quite a change from past movies. With all characters in Gotham brought to life, it is only natural that the transformation of the Joker to be something entirely grotesque and scary. The joker is not funny, he takes his chaos seriously. He is clever and entirely immoral. The manifestation of evil of the old joker into Chris Nolan's joker reminds me of Jim Carrey's Mask when it was worn by the villain, his evil was magnified around a thousand times and his capabilities amplified. It was as if Ledger has found this mask and with it found a way to elucidate evil and madness and present them too us vividly. A lot has been said about the Joker, both as a character and as a performance. To repeat what has been already said would serve him no justice. It is entirely shocking what Ledger has done. It was as if the joker's make up has covered both the identity of the joker and its performer. "Excessively spontaneous yet focused and calculated, Ledger as Joker is an unpredictable, gripping beast," says the daily news. The Joker is real, he tells us that evil is something that we should be scared of, that even our heroes cannot fight alone. He is extremely charming and appealing as is most evil, but his ends is utter destruction. The Joker is the movie, and at the end, the Joker won. Everyone of the trio standing up in the face of evil has had to sway from the path of absolute right in order to combat the Joker. In the end regardless of whether they stopped the Joker or not, they've all lost. But to be fair, the Joker lost as well, though I doubt he cared. In our world there's no absolute right and no absolute truth and we do the best we can. It's not the act itself that's good or evil, but our intentions, but images must be kept. The world expects goodness without any sacrifice, but those who must provide it have had to make these sacrifices. This is what we're told. The movie puts all the good people against insurmountable odds, constantly, until they give way. This is evident when Batman asks Lucious Fox to spy on people and asks Commissioner Gordon to lie to people. However, despite their moral bends, the Joker is beaten by the people. There's a subtle difference between bending our morals and breaking them. It's evident with Harvey who had given himself no choice but the right way until he broke. Individuals can make mistakes but the general morality in Gotham is not completely lost. No normal person would be so devoid of morals even if it is a prisoner on death row, only a lunatic like the Joker can smile in the face of chaos. all of that,all together made a good movie..a serious one!! and reading your analysis made it even better.. Thanks anonymous, I'm glad you enjoyed the review and I'm glad that you enjoyed the film as much as I did. Wow! Some review! I liked the analysis across the history of the genre. "The Joker is the movie, and at the end, the Joker won. Everyone of the trio standing up in the face of evil has had to sway from the path of absolute right in order to combat the Joker. In the end regardless of whether they stopped the Joker or not, they've all lost. But to be fair, the Joker lost as well, though I doubt he cared."